Elder Scrolls Online is a fully voiced game, and its cast includes many notable actors. On 23rd June 2017, ZOS developers Bill Slaviseck (Senior Writer) and Becky Ichnoski (Dialog Coordinator) appeared on ESO Live to give an insight into the voice acting process. 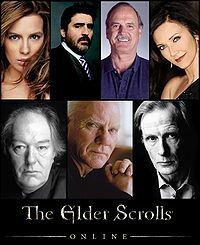 As of the Morrowind update, Elder Scrolls Online has 77 actors and 150,000 voiced lines. The Morrowind Chapter has over 6000 lines. Beckinsale (IMDb) takes on the role of Queen Ayrenn, the leader of the Aldmeri Dominion and Queen of the High Elves who is far more comfortable with a blade than her crown. Cleese (IMDb) plays Sir Cadwell, the cheerful and endearingly mad lost soul who is not afraid of anyone, even a Daedric Prince. Molina (IMDb) takes on the role of Abnur Tharn, a wily old wizard and politician who is the head of the Empire's Elder Council, and the de facto power behind the Ruby Throne. Carter (IMDb) plays Azura, the Daedric Prince of Dusk and Dawn from Skyrim who is a popular part of Elder Scrolls lore. Gambon (IMDb) voices The Prophet, a mysterious blind man who guides the player through their journey to retrieve their soul. McDowell (IMDb) plays the key figure Molag Bal, an evil Daedric god from another plane who schemes to enslave the mortal souls of Tamriel. Nighy (IMDb) joins the cast as High King Emeric, a merchant prince whose luck and determination won him the throne. Stormare (IMDb) plays Jorunn the Skald-King, an unexpected monarch who led his people into an unlikely alliance. Ward (IMDb) voices Mannimarco, a renegade High Elf wizard exiled from the realm for raising the dead and the world's most powerful necromancer. Hale (IMDb) appears in the role of Lyris Titanborn, a Nord half-giant, who, along with the Prophet, aids the player on their journey. Richardson (IMDb) rounds out the cast as Sai Sahan, a noble martial artist and master swordsman. M'aiq the Liar's voice actor is Keith Silverstein (IMDb), who also plays Narsis Dren. Naryu Virian is played by Kath Soucie (IMDb). Raynor Vanos is played by Joseph Gatt (IMDb), who also voices Speaker Terenus and some Altmer characters. Razum-Dar's voice is provided by Christopher Smith (IMDb). Vanus Galerion's voice is provided by Taliesin Jaffe (IMDb), who also voices Vicereeve Pelidil and some Altmer characters. King Kurog's voice actor is JB Blanc (IMDb), who had previously played Bosmer characters in ESO before being asked to take on the role of the Orc king. Eveli Sharp-Arrow is played by Mary Faber (IMDb). Velsa from the Thieves Guild is voiced by Debra Wilson (IMDb). Spencer Rye is played by Travis Willingham (IMDb), who also voices Percius Loche. Speaker Terenus is played by Joseph Gatt (IMDb), who previously voiced Raynor Vanos. Kor's voice is provided by Taliesin Jaffe (IMDb), who also voice Reman Mevavius. Vivec is played by Robin Atkin Downes (IMDb), previously Brynjolf in Skyrim. Veya is played by Helen Sadler (IMDb), who also voiced Solgra. Becky Ichnoski has posted a list of Summerset voice actors on the official forums - the post can be found here. All three of the original Powerpuff Girls actors appear in Elder Scrolls Online: E.G. Daily who played Buttercup appears in the Morrowind Chapter. Tara Strong who played Bubbles and Cathy Cavadini who played Blossom also feature in ESO. At launch, every race had 8 male and 8 female voice actors. Then Becky Ichnoski worked out how to "hack" the voiceover tools to add more variety, and these tools have now been rewritten. According to Becky Ichnoski on ESO Live, 23rd June 2017, the Nord accent is the hardest for the voice actors to do. This page was last modified on 12 October 2018, at 16:13.